Looking at the cold statistics, as Blues’ aficionados probably will in the future, this was a successful season for the Blues: a close third in the League for the second year running, with a record points’ total, and losing finalists in two cups. However, if this was a School Report Card, in the Comments Section at the bottom, the players themselves would probably write, “Could have done better!” It’s a common feeling, shared by most performing artists, no matter how gifted, that their talents should have resulted in more. Back row: Gordon ‘Gordie’ Mackenzie (Senior Coach and reserve goalkeeper); Peter ‘Dokus’ MacDonald (Manager); Andrew ‘Tago’ Maciver (Club Captain); Kenny ‘Beag’ Maclennan; Gordon Craigie; Calum Mackay; Kevin ‘Savo’ Smith; Alex Smith; Billy Anderson; Calum ‘Tom’ Moody; Ross ‘Tago’ Maciver; Murdo ‘Squeg’ Macleod. Front row: Dan Crossley; Kevin Anderson (Assistant Manager and midfielder); Seamus Macleod; Domhnall Mackay; Darren Mackinnon; Kenny ‘Dokus’ Macdonald; Gordon ‘Tago’ Macdonald; Chris Macleod; Kevin ‘Gochan’ Macleod. 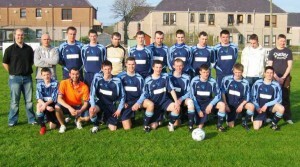 Taken at Goathill Park, Stornoway, on 13.4.09, on the opening game of the season, a 1-1 draw in the League with Athletic. Missing from photograph: Domhnall Iain ‘DI’ Maclennan; Andrew ‘VP’ Macleod; Scott Macaulay; Donald ‘Tocan’ Chisholm; David ‘Cirbhig’ Macleod; David Morrison; Phil Macleod; Andrew Rennie; Calum Macleod; Neil Mackay; Calum Fraser.